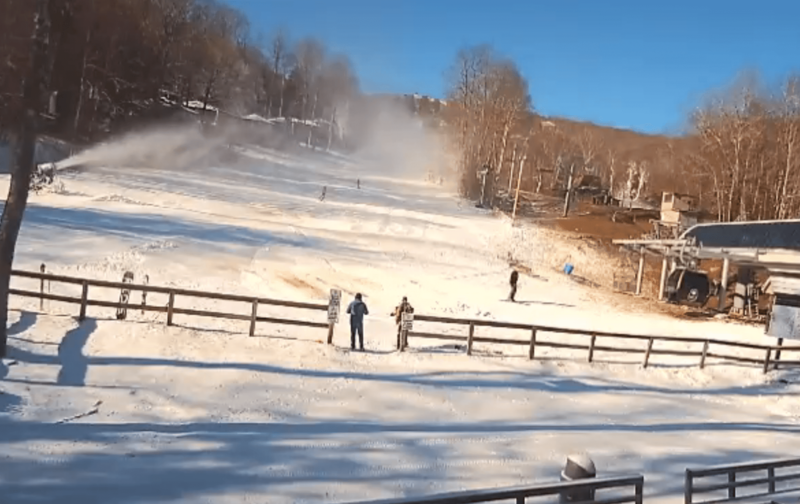 Home News Announcements Cataloochee Ski Area & Sugar Mountain Opens Today! It was 21° here in beautiful Sleepy Hollow this morning and that forced the first cup of coffee for me of the season. I’m really only an occasional coffee drinker and only then during winters…and I guess it is that time. 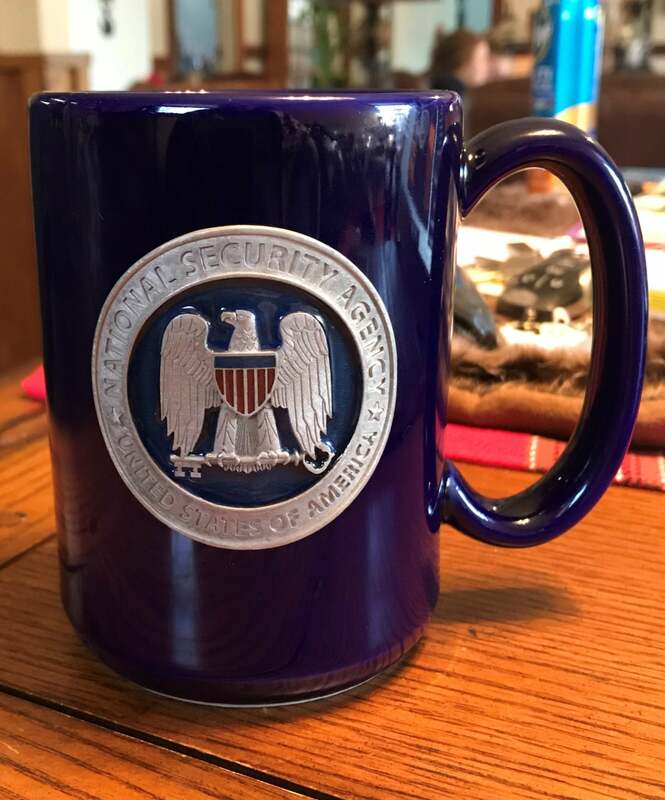 Thanks to my good friend (and NSA staffer) Emil for sending me an official NSA mug. It somehow makes me feel safer, warmer. Ha Ha. 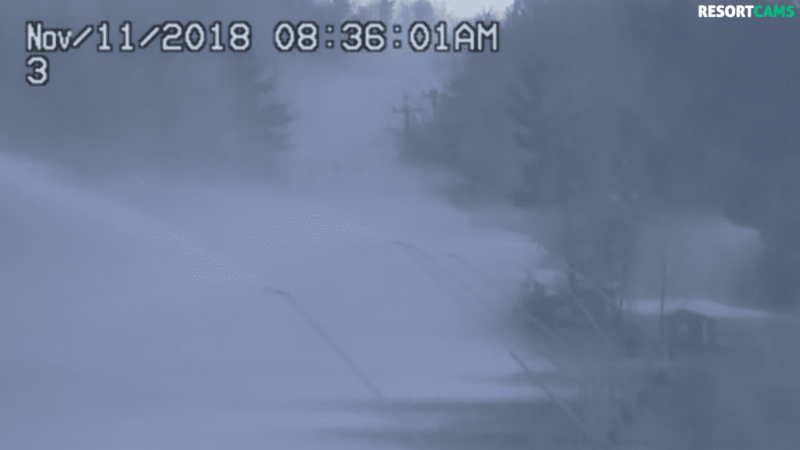 Sugar always plays things closer to the vest about opening (not just with us) but as we posted on the SNOW REPORT on Saturday, we suspected that Sugar would open today as well and they did at 9am! Good to see peeps on the slopes. Sugar is reporting 6-30″ and some (understandable) thin coverage is already peeping out if you enlarge that photo. 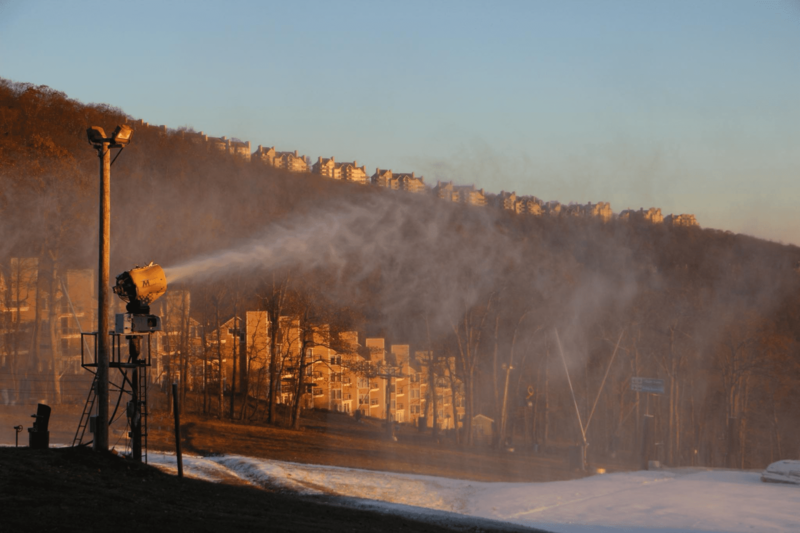 However, kudos to both resorts for getting open on ONE DAY of snow making. 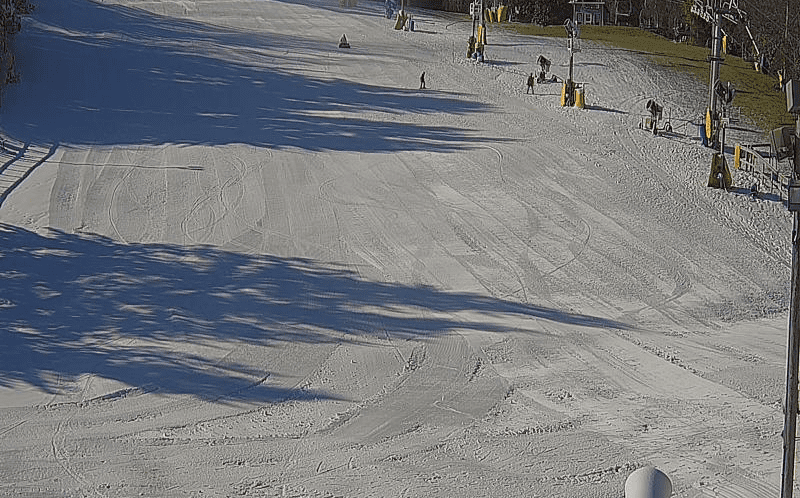 You can check out the details of numbers of slopes open on our SNOW REPORT, as well as projected opening dates for other ski areas. Tammy Brown posted a hashtag (#thankyouforyourservice) and shared that all veterans will get a free lift ticket today. Cat will be open from 9am-4:30pm for a $25 lift ticket for all others. 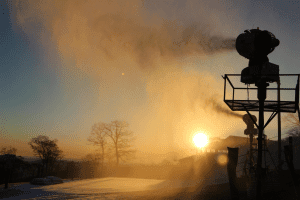 Eight of the region’s ski areas are making snow this morning. Here is a quick glance look at what’s happening: You can also check the SNOW REPORT to see expected opening dates and the full report. 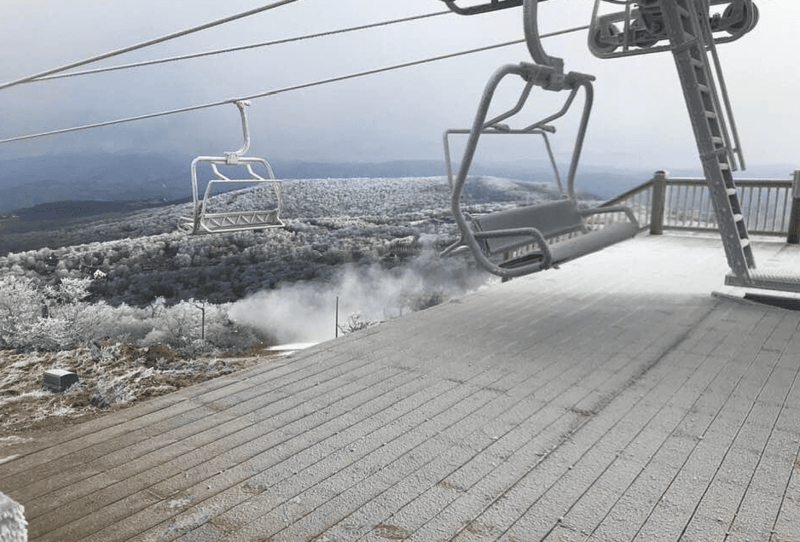 25° Appalachian Ski Mountain – Opens Nov 16th. 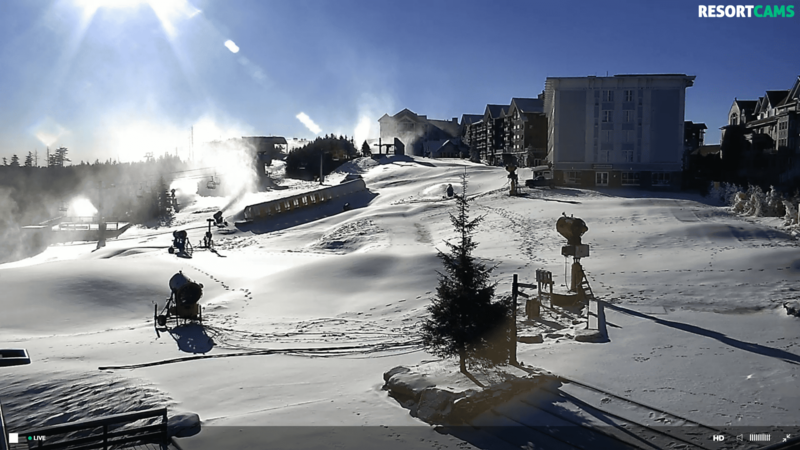 28° Beech Mountain Resort – Opens soon. 28° Bryce Resort – Opens soon. 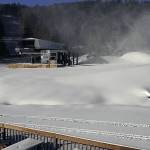 24° Massanutten Resort – Opens soon. 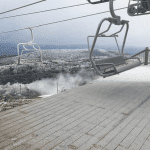 24° Snowshoe Mountain – 6″ of snow already this preseason! Opens Nov 21st! 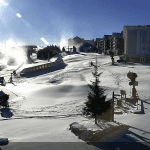 10.6° Canaan Valley Resort – No update. 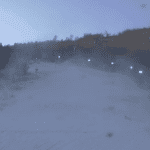 Snow is on tubing hill. 27° Omni Homestead Resort – opens early December & waiting for the rain to pass. 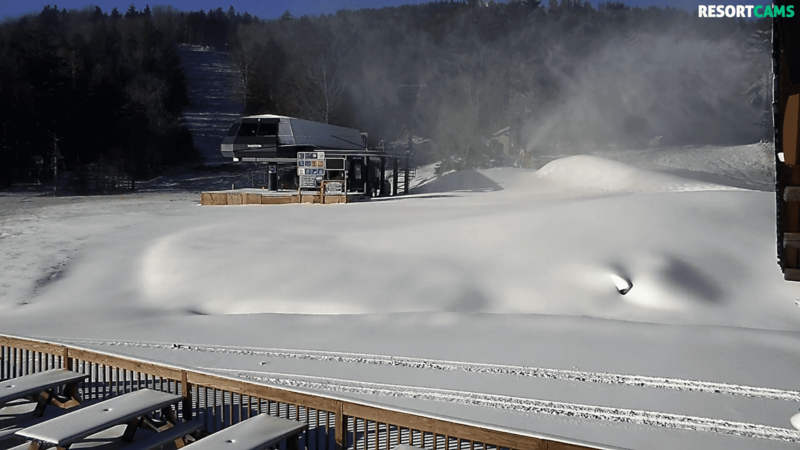 23° Wisp Resort – Tested system on Saturday. Waiting for next cold snap. 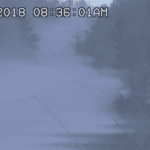 Six tenths of an inch of snow has fallen over the last two mornings at Canaan Valley and Timberline in Davis, West Virginia. 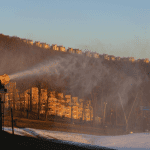 Appalachian Ski Mtn.’s 57th season is scheduled to begin Friday, Nov. 16 weather permitting! To celebrate, the first 100 guests to the Ticket Cashier Window will receive a FREE ski ticket! Get ready for ski season! 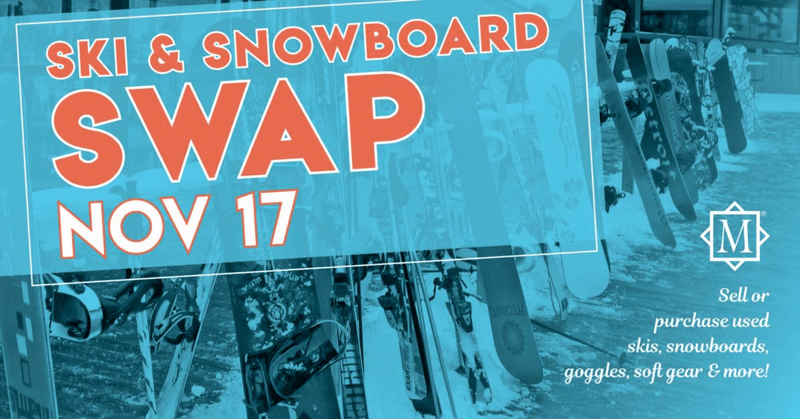 Massanutten’s Ski & Snowboard Swap is the best place to sell your gently used gear and find all you need for the upcoming ski season. Products available for purchase will include used skis, snowboards, goggles, soft gear, and other mountain sports equipment offered at great prices. Plus, The General Store will have new products available for purchase during their one-day-only Sidewalk Sale. Mark your calendar! Join them on November 23 as they welcome Old Man Winter and the upcoming ski season with Tree Decorating/Lighting and the Ullr Bonfire. THINK SNOW! We have received A LOT of email and text inquiries from people wanting to know “what’s going on” and “whether or not Timberline Resort will open this season”. We do have a call in to their peeps, but have not heard back as yet. I know ownership reads our posts, so perhaps we can get a word with them Monday. Social media is pretty active from “inquiring minds who want to know” as Timberline IS a favorite for a lot of people. They’ve had some financial issues for several years now and in each of the last couple of seasons they have been working with some creative ways to get on more stable ground. Our guess is that they WILL get open, however we will try to get fans some news asap. Timberline has posted this comment to their Facebook page, describing “full recapitalization” of the mountain. Timberline Four Seasons Resort and its family of companies is announcing the full recapitalization of the mountain. It’s been a long journey, and one we have all made together. Season passes will go on sale next Thursday for $499. Bear with us as we negotiate with #FirstEnergy and #MonPower a return to full electric and #Frontier phone service in the main lodge during this interim period, hire new staff, (and reward existing staff) as well as install our ski specific software and real time reporting. Homeowners whose property is listed with T4SR.com will receive 25% off of season passes for themselves and immediate family. Thank you for choosing Timberline. Recapitalization means that a family, who is the 3 partners of Timberline put money into into the mountain from the family, not loans, and not Wall Street and not public money. As a small immigrant family business enterprise 33 years ago and new Americans, they did this because of a commitment to growing jobs in West Virginia; it was the area of the United States most in need of jobs. (The other option available at the time was in Costa Rica, thus not in keeping with the most patriotic choice for the family.) It is now, after 20 years without meaningful upgrades in snowmaking, very much time to reinvest in that core mission and snowmaking infrastructure. That investment will include aesthetic upgrades as well. Recapitalization is intensive, complex, risk averse and it takes experts to deal with the process, the investors and the resulting capital to improve your experience. We hope you enjoy the mountain this year. We will get you guys some input as soon as possible. 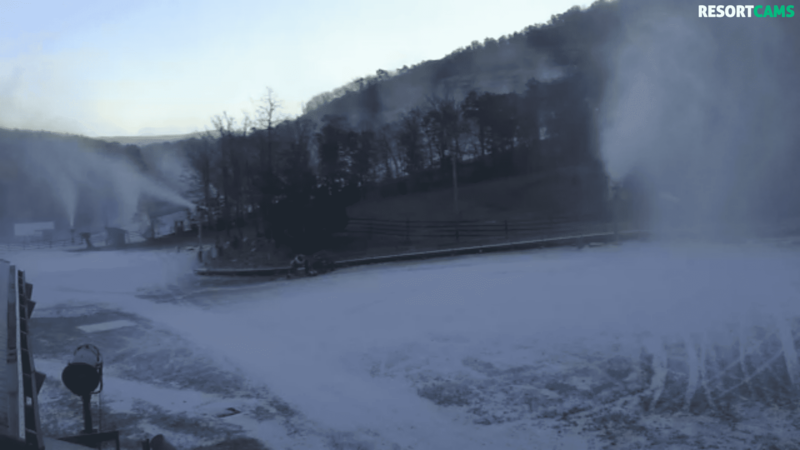 Click to enlarge photo from Wintergreen this morning! Beautiful morning up on the mountain! 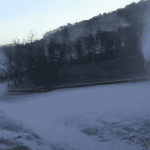 Our snowmakers were up early testing the system and “blowing the rats out”. It won’t be long before we start covering the slopes with snow for the season. Who’s ready? Here are some additional photos of the day: Click to Enlarge! What is a ‘SkiSoutheast Member Resort”? As usual, we are scrambling to get the Spring, Summer, Fall cobwebs out and on Saturday we heard from a ton of resort ops on content that they want to share. We will hustle to get all that news to you guys over the next couple of days. 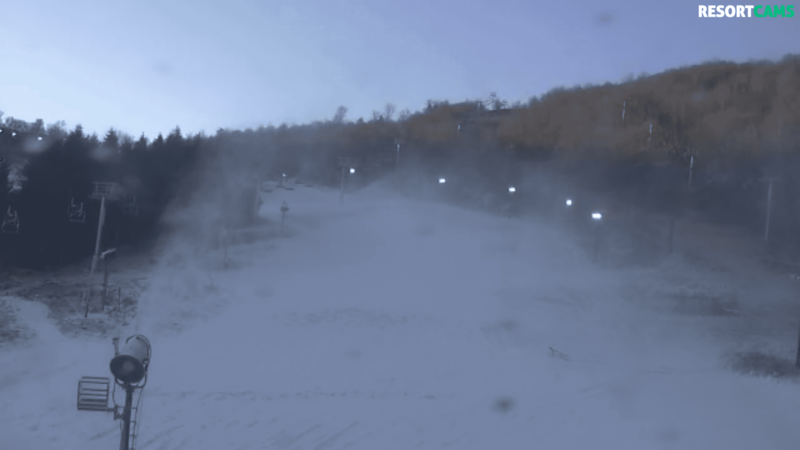 SkiSoutheast.com, ResortCams.com and all of our weather content (and now the new www.HighCountryVacations.com) are independently owned and operated totally segregated from any ski resort, ski association, etc. That allows us to provide unbiased reporting. Last year another resort “joined us” and that prompted us to reach out to the rest to more uniformly promote resorts as equitably as possible. As with any kind of advertising-supported model, some resorts “do a bit more” and therefore deserve more of our attention, etc.. Conversely, we also have to take a “NO” as graciously as a yes and and to that end, we only received one “NO THANKS”. With that in mind, we will still provide slope openings, snow reporting and more for ALL ski resorts via our SNOW REPORT page, however to be more fair to the 15 of 16 ski area that do support us, we will not provide direct promotion via our front page, photos, weather, and video shares. 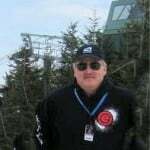 You can still find dedicated pages for EVERY ski resort via our top navigation, along with contact information, mountain stats (including snowfall totals for every year going back 10-15 years), snowboarding info, photos and videos, webcam links and links to websites and more – for every resort. So the only thing that’s really changing is that we won’t be visiting and doing feature photos, videos or content shares with ‘non-participating’ resorts on our front page news, featured photos of the day, videos of the day, etc. In summary, we’ve worked hard for 22 years now to get to the point that we delivered more than 6 million, unique visitors last season and more than 32 million page views and we simply want to better assist ski areas in promoting our great industry and the mountains which we love.